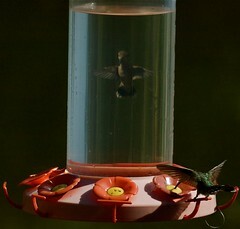 Sunday snapshot: hummingbird caught in the bottle! I captured this hummingbird in a feeder at the Rio Grande Nature Center State Park in Albuquerque, New Mexico last August when we visited the town to attend the 2009 annual meeting of the Ecological Society of America. It was a lovely break from the meetings sessions to go for a morning of birdwatching along the Rio, which must be getting plenty of action these days since it is one of the significant migratory flyways in the arid southwest! You can read more about the history of the park here, and view more of my pictures from that day in my flickr album, also accessible by clicking on this picture (I think – but this is my first attempt to blog directly from Flickr, so I don’t yet know how links work!). This entry was posted in behaviour, birds, photo, river on October 18, 2009 by Madhusudan Katti. Occam’s razor for graduate students! This entry was posted in academia, humor, science on October 18, 2009 by Madhusudan Katti. California got one of its classic winter storms yesterday after a prolonged drought. You know, the kind that starts way out over the Pacific ocean, building up steam from the ocean’s moisture, taking a few days to make landfall along the California coast, and emptying itself over lands that have been parched for too long. The kind of storm that was the lead character in George Stewart’s 1941 classic of meteorological fiction: Storm. Except, in Stewart’s incomparable novel we get to watch and follow along as the storm grows from a baby off the coast of Japan into a classic monster of a storm that explodes over the California coast and rages for several days soaking the valleys, burying the mountains in snow, and making rivers strain against the levies. Last night’s storm was a bit different, being a remnant of a typhoon that had already raged over Japan a week ago, and poured itself out in a little less than 24 hours – but it did bring record precipitation in the mountains of the central Sierra Nevada: upto 14 inches in some places, almost monsoonal in its magnitude! This storm, while it did down its share of power lines and cause worries of floods and mudslides, especially in parts of the state that were aflame in summer’s forest fires not too long ago, didn’t quite pack the same kind of heavy punch that Stewart’s storm did. As I watch these clouds, remnants of the storm marching along slowly towards the mountains in its wake, I marvel at the sudden realization that the water vapor in those clouds was part of the Pacific Ocean, just a few days ago, perhaps all the way across that vast ocean! These magnificent and sometime fearsome storms remind me of the elemental powers of nature, of sun-warmed oceans and water vapor and wind, and how connected everything is on this little blue marble floating in the cosmos. And how we, along with all other forms of life we know of – every last living thing we’ve discovered thus far – cling to the thin layer of life, the biosphere, near the surface of this marble, and how much we really depend upon all that energy being churned up in these storms! Here in California, the summer was particularly heated due to ongoing human battles for control over water: whether farmers or fish had more right to it, whether water should flow through its natural river channels or out of its way where we force it closer to where the food grows! The great central valley of California is one of the world’s great bread-baskets, a valley we humans have transformed from a semi-desert into a tremendously, almost preternaturally productive agricultural region. Yet it remains part of the dry American southwest, a region that has been drying up for quite a while before humans appeared on this continent, and that has continued to exhibit wide variation in climate, especially rainfall, in the manner characteristic of deserts. Indeed, the inherent unpredictability of rainfall around here has already swallowed several human civilizations that flourished here for a few centuries before crumbling into the sand and dust against that slow long drying trend, well before our current and most hubristic iteration of the game of civilization started but a century or two ago. So intent are we on “civilizing” ourselves and our habitats, and so supremely overconfident in our technologies that we think we can really tame all the forces of nature, that we can move mountains, change how, where, and when rivers flow, grow rice and cotton in this desert, and build ever-growing cities, without consequence to ourselves, never mind all the other living beings that have inhabited these places for a lot longer than us African upstarts. Don’t get me wrong, I dig the sheer gumption of our species in adapting to almost every shade of environmental variability our planet has thrown at us – and thriving in the unlikeliest of places, even if briefly. Indeed, one reason I so love Stewart’s novel is that it is both a celebration of the elemental forces of nature, and of humanity’s ingenuity and resilience in the face of such natural forces. For in that sprawling multidimensional, multi-disciplinary book the great author gives us a lesson not only in the birth, life, and ultimate explosive end of a great Pacific storm, he also gives a wonderful sweeping overview of the myriad ways by which humans had transformed California by the 1940s. While the storm itself is the leading lady of the story, the supporting cast of human invention is varied and impressive too, ranging from highways, railroads, and power lines that cut across some of the highest mountains on the continent, to dams that hold back water to harness its power, and to divert it through a network of canals to places where we want it to go before it ends up in the ocean, to the cities where people grow increasingly alienated from the earth and its varied powers. Back in the 1930s and 40s, even as the region was being transformed by large-scale government investment in the wake of a crushing depression that drove many a Joad family westwards, Stewart hurled his richly imagined storm against a tenacious human population, and his vision remained largely hopeful and optimistic. Its harder to maintain that optimism now, when we find ourselves in another economic depression, this time amid whole new threats from recent anthropogenic global warming which threatens prolonged drought cycles for the American southwest, turning many of our farms into dustbowls. And we continue to squabble over how fast we want to use up the little water we do have so we can continue farming in this cadillac desert! The universe and our planet are highly dynamic (and nonlinearly so) places, and so is Life! Life has evolved and thrived on this planet mostly because it is able to adapt to changing environments and evolve new ways to spread and grow in novel places. Humanity’s outlook, on the other hand, remains largely static or linearly progressive, a result of our relatively short life-spans, and our brain’s unique ability to extrapolate based on experience, which is both an asset and a constraint. Because we haven’t (personally for most of us) experienced drastic fluctuations in the environment, we find it hard to visualize its consequences, or even believe it is possible. Our collective memories are also fairly short for we don’t seem to learn from the failures of collapsed societies. Other species (and even our ancestors) best exhibit their dynamic resilience in the way they move and disperse across the planet when faced with changing climates. Those that do not or cannot move as their habitats change are likely doomed to extinction, while those who disperse to new environments are more likely to survive even if in a new form. Like our ancestors who sought fortunes outside Africa as the climate changed there, populations of successful species tend to flow across the planet even as habitats and zones of physiological suitability ebb and flow across latitudes. Recently however, the human response to changing, unpredictable environments, is to actually change the environment to dampen and control that variability! We don’t move ourselves so much as we develop technologies that give us our physiologically favored climates wherever we may be! This evolutionary peculiarity is perhaps unique in our species although many (most) other species also exhibit some limited levels of local climate control. No one has taken things as far as we have! Many (most) species exhibit some level of site-fidelity and territoriality, and many have come up with ritualized ways to control access to resources in the face of competition. Territoriality is mostly reserved against members of the same species, or a handful of other species who may compete for the same resources. We, however, are perhaps unique in extending our territoriality not just to conspecifics or actual competitors, but to virtually every other species in our habitats! As part of controlling our environments, we want to control populations of every other species occupying those environments, restricting their distributions according to our property boundaries! The human cultural notion of property, of ownership of land/water – chunks of this planet – containing natural resources, has fueled much of our rapid socioeconomic growth, but I think it is also a maladaptive trait over evolutionary times. For the notion of property, esp. private property, is an extrapolation of our territoriality which becomes a serious constraint when coupled with our static/linear, short-term mindsets. We so tie ourselves to specific places now that we have broken the evolutionarily adaptive flexibility (see point 3 above) that allowed us to survive major environmental changes in the past. We have sought to impose a static structure on the landscape wherever we live, and struggle furiously to hold those static lines we have drawn on the landscape in place against climate change. And perhaps the worst consequence of our static thinking about the landscape and our pan-specific territoriality is that we’ve doomed so many other species to becoming stuck into static compartments of their habitats, those boundary lines we’ve drawn on maps (where we decide whether they may live or not), where they are no longer able to flow to new places as the climate changes. Not only have we cleverly painted ourselves into corners of habitats while the climate changes, we’ve doomed many other species to extinction simply be being unwilling to let them come and go according to their own rhythms. A good friend of mine in India, a keen naturalist and natural philosopher, once remarked that “movement is a very bad thing“; he was referring to the incessant movement of human beings across the planet which is inexorably linked to the destruction we have wrought to habitats all over the world, not to mention the invasive species we have moved along with ourselves to decimate native floras and faunas everywhere. 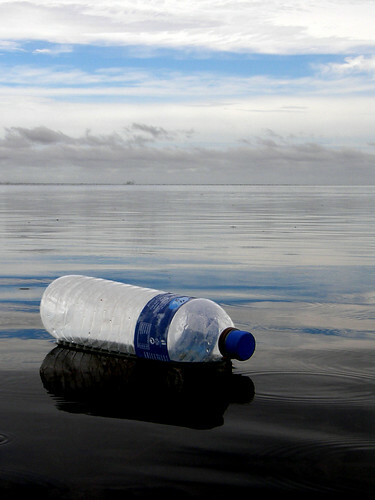 The global reach of our activities can perhaps be best exemplified by the vast plastic flotilla now circling the great Pacific gyre, our plastic bottles and packaging and toys which have ended up thousands of miles from shore in the middle of the biggest ocean on earth. The same plastic gyre over which, no doubt, this winter’s first Pacific storm grew in strength last week. 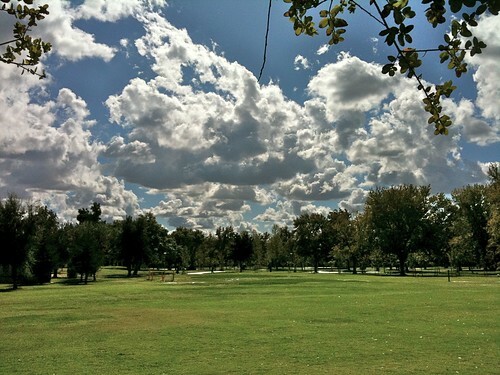 As I contemplate the remnants of that storm float across the skies of this central valley city, I now disagree with my friend: movement, far from being a bad thing, is in fact the very thing that has allowed life to flourish here on earth. What’s bad about our current predicament is that we have (despite occupying the entire planet), in some very important ways, stopped moving even as the world continues to change around us! And as we paint ourselves thus into an evolutionary cul de sac, we seem hell bent on taking down as many other species with us as we can! So the large looming challenge of global climate change boils down to one key question for me: will we rediscover our adaptive flexibility and start moving with the world again (and allow other species to move as well)? Or will a future major storm wash away the vestiges of our civilization, cleanse the earth, and give a fresh start to life in our aftermath? This entry was posted in activism, Blog Action Day, climate change, global warming, human, reconciliation on October 15, 2009 by Madhusudan Katti. Overwhelmed by cynicism and pessimism about the state of the planet and how little we are doing to fix urgent global problems? Hoarse from calling upon governments and politicians and CEOs to change policies and business practices towards social/economic/environmental justice? Despairing for the world we are leaving behind for future generations? Looking for something new to light that fire anew, to inspire you again to keep at it, to show that the world can change for the better, even if only in small steps incrementally? So cheer up! Things can’t be all bad if our species can still produce such kids, even in the worst of circumstances, eh? This entry was posted in activism, Apathy, cool, human, world changing on October 13, 2009 by Madhusudan Katti. Explore the Nature Blog Network, now featuring Reconciliation Ecology! A little while ago, when giving this blog a makeover, I also submitted it to be part of the Nature Blog Network, an excellent collective of 876 blogs (as of today) where people write about all aspects of nature. For us bloggers, it brings in readers, and also provides some tracking tools to monitor traffic. But more importantly, as the blurb on their main page says, Nature Blog Network is “a nexus for the very best nature blogs on the net. If you’re looking for outstanding blogging about birds, bugs, plants, herps, hiking, oceans, ecosystems, or any other natural topic — or if you blog on those topics yourself — this is the place for you!” So its a great place to discover blogs covering topics of interest to you but that you may not know about (like this one!). So go explore the nexus. In addition to the listings of blogs in a top list, and among various categories, they also showcase individual blogs as part of a weekly series of Featured Blogs – and this week, they’re featuring Reconciliation Ecology! What an honor to be featured among “the very best nature blogs on the net”! So if you want to read an interview with yours truly, head on over there to learn more about me and why I blog. And while there, you may get lost in a wide range of other nature writings. 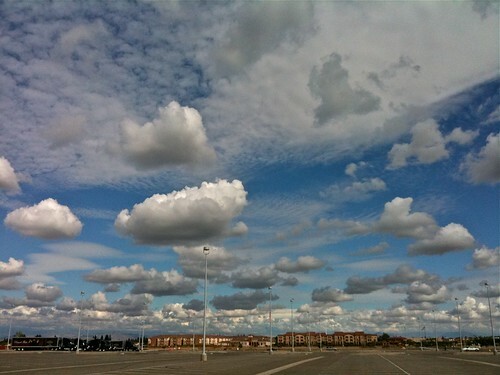 If, on the other hand, you’ve come here after reading about this blog on the network: Welcome! I invite you come in and explore as you walk through some of my earlier writings – and hope you like enough of it to want to come back and walk with me from time to time. This entry was posted in blog, nature on October 12, 2009 by Madhusudan Katti. This had to be done, given how much yesterday’s news has everybody agitated in this country, so here’s my contribution to the “Kanye interrupts” meme. 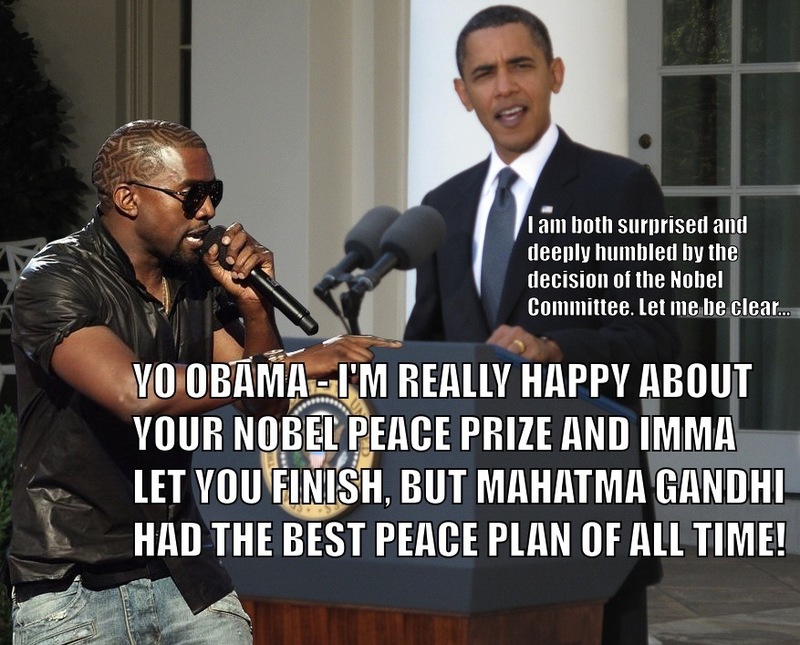 I had to call upon Kanye to step in on behalf of my old homeboy Gandhi! This entry was posted in humor, politics, US on October 11, 2009 by Madhusudan Katti. Thoughts on “The Origin Cycle”, or why does the Darwinian vision evoke darkness? Must the struggle for existence necessarily be a bleak experience? Can we not exult in the wonders produced by natural selection without despairing over “nature red in tooth and claw”? Why do Darwin’s own words about the “grandeur in this view of life” invoke a contrary view in so many, that this evolutionary view of life must necessarily lead to nihilism and despair? These questions disturb me again now since last night’s performance of “The Origin Cycle ” a musical performance of eight selections from “On the Origin of Species” at Stanford University. Let me state first off that I am no music critic (even my iPod listening tends towards spoken word podcasts/books rather than music), and that this particular genre of music is rather outside my normal listening sphere (and don’t even ask me what this genre is!). So consider this more a response to the emotions evoked in me by the music, and my subsequent intellectual response to those emotions. I found the concert and performances quite wonderfully evocative – even though our 9-yr-old Darwin fan fell asleep after failing to track the words being sung by the soprano Jane Sheldon; she was still impressed enough to want to meet the musicians and get their autographs on the program! As the friend who invited us to the concert remarked, the compositions were quite complex musically – and appropriately so, I thought, given the subject. So the music did capture the chosen text quite well (I’ll share the passages featured later tonight when we return to Fresno), but – and I can’t quite put the finger on the role of any particular element in this – I felt the general emotional tone was on the darker side, with melancholy washing over me far more than joy. No wonder then, that the one upbeat composition in the middle, set to a passage about the “Tree of Life” really lifted me up, but all too briefly, before the mood became sombre again. I was hoping for more uplift towards the end, with the final two pieces revolving around Darwin’s immortal words about the “Entangled Bank” and the grandeur in this view of life (Floreana) – but those compositions were darker too. The conductor, Jeffrey Means, later told me that “Tree of Life” was the ensemble’s favorite too – but I didn’t get the chance to ask him about the darkness of the other pieces. So I am left with the sense that the composers of these creative pieces too share a darker view of the meaning of Darwin’s work even as they celebrate it. I, for one, would prefer more joy, and more thrill at the sheer intellectual adventure of Darwin, as seen in this week’s Nova special on “Darwin’s Darkest Hour“, which was less dark than the title suggested – but perhaps I should leave that review for a separate post. This entry was posted in darwin, evolution, music on October 9, 2009 by Madhusudan Katti. The Centre on Monday declared the river dolphin as the ‘national aquatic animal’ on a proposal moved by Bihar Chief Minister Nitish Kumar. Bihar, where the animal is known as Soòs, accounts for the largest number of Gangetic dolphins, whose number could now be only a few hundred. Besides the Ganga, the river dolphin is also found in the Brahmaputra, the Indus and their tributaries. The smooth-skinned, grey-black dolphins come with long snouts. “Like the tiger as national animal and the peacock as national bird, we have declared the dolphin as the national aquatic animal. It represents the health of the rivers, particularly the Ganga,” environment and forest minister Jairam Ramesh said after the first meeting of the National Ganga River Basin Authority chaired by PM Manmohan Singh. After the declaration, the government is expected to unveil a ‘Project Dolphin’ aimed at saving the rare freshwater species from extinction. The animal figures in Schedule-I of the Indian Wildlife Protection Act, 1972. Less than a month after Rahul Gandhi warned against “playing with nature”, Union Minister for Environment and Forests Jairam Ramesh said the idea of interlinking India’s rivers was a “disaster”, putting a question mark on the future of the ambitious project. “The interlinking of rivers will be a human-ecological-economic disaster. It is easy to do interlinking on paper. Interlinking of rivers has limited basin value, but largescale interlinking would be a disaster,” Ramesh said at a press briefing today. In Chennai last month, Rahul had expressed concern over the environmental fallout of interlinking. “We should not play with nature on such a massive scale,” he was quoted as saying. I wonder whether Ramesh and Gandhi can actually kill this boondoggle entirely – because the BJP and other allies of the project are already gearing up to push back. The key may lie in another word used by Ramesh in describing the project as a disaster – not must ecological, but economic too! That may very well be the key turning point… one hopes. This entry was posted in economics, environment, India, river, water on October 8, 2009 by Madhusudan Katti. In which Ripley drips acid rain all over Fox & friends’ cheery morning parade! This entry was posted in activism, climate change, global warming, ocean, pollution, video on October 6, 2009 by Madhusudan Katti. Would that more towns/politicians/governments, prone as they are to prohibiting various things, start banning this sort of thing!! Its the kind of small-scale local action that, if it went global enough, could start helping us clean up this mess. Meanwhile, you can read updates from ongoing efforts to simply study and understand the latter here, here, and here – I don’t think we are anywhere close to beginning a real clean-up there yet. Not even sure how we might or where to begin. Except at home. So think about this before taking your next sip! This entry was posted in conservation, environment, marine, pollution, urban, water on October 5, 2009 by Madhusudan Katti.